I adore these vintage barkcloth drapery panels. 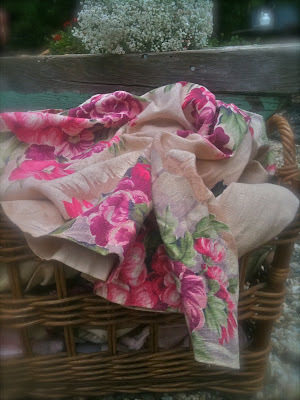 There is something so fantastic about vintage barkcloth fabric. The nubby texture, delightful colors & vintage designs. and the colors are vibrant even after so many years. They were never used- the panels had original tags pinned to them. but they are in wonderful condition. and lined in old cream cloth. Elegant, warm and vintage cottage sweet. 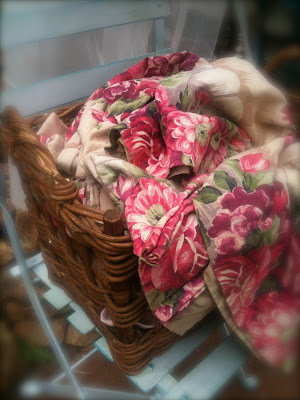 I am loving them just sitting in a basket or folded in an old french armoire. Those fabrics are so beautiful. They inspire thoughts of romance and delightful days in the garden. You really have some lovely pieces there. Oh my goodness...how beautiful they are...so vibrant! Wonderful find. I like barkcloth. I have a couple of pillows made from barkcloth in the kids' playroom. What beautiful fabric. The colors are just lovely. Oh my, I want to know where these pretty panels will go...maybe as portierres somewhere in your house? Around some french doors?? I never got your email for some reason, could you try resending it? Those are some beautiful fabrics, especially that pink one. Gosh, that's pretty. I love that basket too. 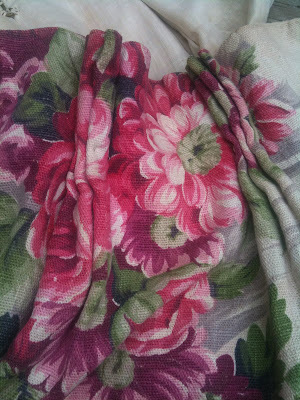 What a gorgeous fabric, Courtney! I'd love to see where you use them. I wonder, if they are older, if they are shorter than what we hang now. oh how beautiful! Hugs and wishes for a day filled with Happy! Those are gorgeous, Courtney and I can't wait to see where you use them. Love your photos, girlfriend! The colors in that cloth are gorgeous! Can't wait to see what becomes of them. That fabric is just gorgeous. I saw some similar fabrics at the Brimfield sale last year that were very pricey! You got a steal! LOVE! So beautiful. They look great in that basket. Can't wait to see where they end up. Those are some wonderful old drapes. I love the fabric and the colors. You can do so much with it. I can't wait to see what you have in mind for them. Looks great in the basket, but I can't wait to see where they end up! Those are so pretty! You were lucky to find them! The drapes are gorgeous! 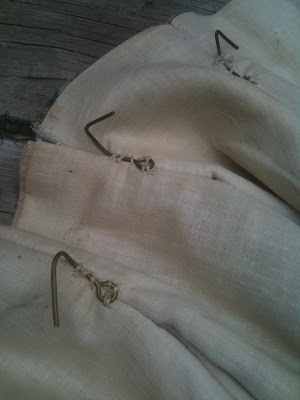 Barkcloth fabric is wonderful. I am looking forward to seeing what you do with them next. Even just leaving them in the basket would be heavenly. Gorgeous roses! I am over from A Rosy Note spring party. 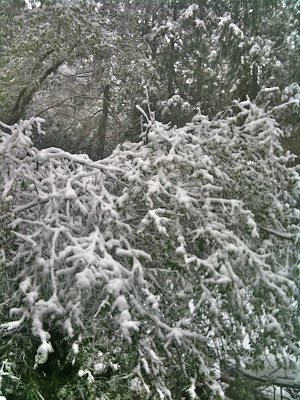 Wow, Courtney, snow in May? That is not good. I will send some warmth your way even though it is going to be much cooler this week. 90's last week and 60's this week. Weird weather. Have a great week and oh, my lost posts never found their way back. Oh my goodness, seriously snow??? It's raining here in So Cal and I do believe you're in Nor Cal. Weird weather but hopefully your lovely backyard stays in tact! Courtney wow I love these too!! Our weather went from nearly 90 and humid down to freezing as well! Sorry to hear about the snow, it really can kill a spring to have snow in May, believe me I know, it has happened to us before too. I love finding vintage barkcloth. I love your pattern. I have used some of mine, I have a hard time cutting it, that is the reason I have so much, but I am getting better about using my fabric stash. I can't wait to see what you do with yours. I hope it warms up for you. Gorgeous drapes, they are stunning. As for the snow, there seems to be a lot of it around today. Love the old drapes. They always had such wonderful color and the over sized flowers always make me smile. 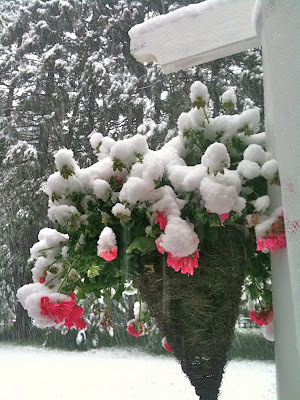 I can recall a time in May while visiting home (Buffalo, NY) and it snowed, it was May 20th. Crazy indeed. Your pics are pretty though. Please Courtney, do not send that my way, it took so long to get rid of it this year. i would have to jump off a bridge if it snowed anymore!! we are putting lawns down now, and one already came in...a week of rain is forcast for Boston, perfect for growing new grass. Hard to believe the now in May, but your picture of the snow on the hanging basket really sets a neat tone for the Cabbage Rose post. I do love the barkcloth drapes. I wouldn't have believed it if I didn't see your photos, Courtney. Oh my gosh!!!! Totally YUCK!!! Our weather took a dive yesterday too. We had a week of sunny and 80 degrees and as of yesterday it's now 50, rainy, and windy. Global warming...???? What's that???? lol! Anyway, at least you have some roses inside to enjoy! :) Love the heft and weight of barkcloth. Yours is sooo pretty! Courtney! 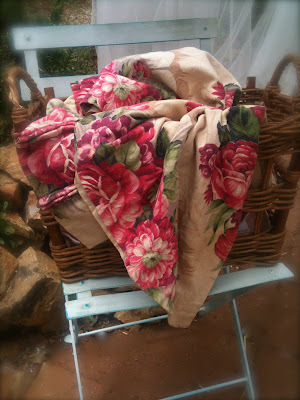 I love vintage fabrics especially barkcloth! You found some great fabric here. Love the look and texture of these great fabrics. 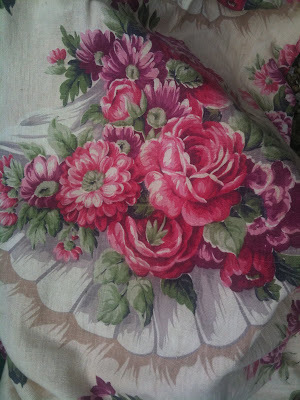 I look everytime I see fabrics in an antique store hoping to find something like your fabrics. Beautiful! Gosh are you in Colorado too? THis weather is just crazy! I think Spring will just slip by and we will get slammed with hot summer! Snow? No way, that's unreal! Anyways, yourd raperies are so sweet and lovely. Can't wait to see how you use them. I'm happy new follower,I'm excited about Feather your nest party this Friday. (thanks for the invite)whoohoo! Come follow back if you can! 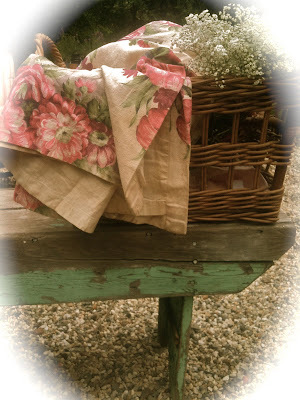 How lucky to find the beautiful barkcloth drapes! It's suppose to snow here in our local mountains in S. CA! Thanks for stopping by. Sorry to hear about your weather issues. Snow? That's just not right. It is unusually cold here in NY and and the flowers just don't know what to do. 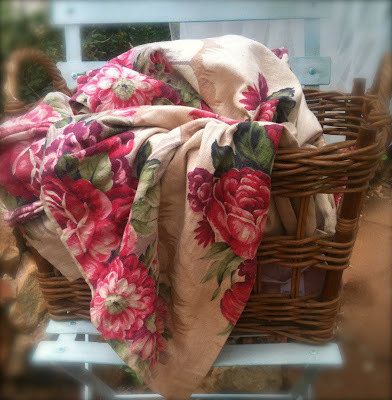 Love your vintage fabric! Making plans to stop by during Feathered Nest Friday. OMG! Did you really get snow?? That's nuts!!! Oh snow, that's strange. I just said the other day I am ready for a normal weather year. It is too much in the weather department these days. Love these bark cloth drapery panels. they would look lovely anywhere! Sorry I am behind had a big weekend and son graduated. Thanks for linking it up! They looks beautiful COurtney! As for the snowI am shaking my head in disbelief!! Loving your new towel holder! ack. I saw your post on FB and was going to comment but didn't get to! I hope your plants and flowers didn't get ruined. :( Love barkcloth- you found a really pretty one. 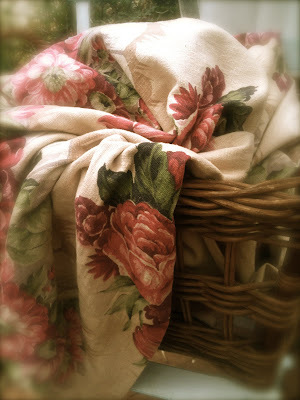 Hi Courtney, Oh, I just love anything with vintage cottage roses. These are gorgeous! I have the same love affair as you do with vintage barkcloth. I've been collecting it for about a dozen years. You found a really pretty design.